That is to say, all airports are aerodromes, but not all aerodromes are airports. In jurisdictions where there is no legal distinction between aerodrome and airport, which term to use in the name of an aerodrome may be a commercial decision. In United States technical/legal usage, landing area is used instead of aerodrome, and airport means "a landing area used regularly by aircraft for receiving or discharging passengers or cargo". The longest public-use runway in the world is at Qamdo Bamda Airport in China. It has a length of 5,500 m (18,045 ft). The world's widest paved runway is at Ulyanovsk Vostochny Airport in Russia and is 105 m (344 ft) wide. As of 2009[update], the CIA stated that there were approximately 44,000 "... airports or airfields recognizable from the air" around the world, including 15,095 in the US, the US having the most in the world. 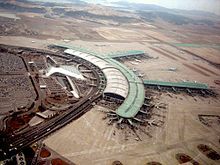 Most of the world's large airports are owned by local, regional, or national government bodies who then lease the airport to private corporations who oversee the airport's operation. For example, in the United Kingdom the state-owned British Airports Authority originally operated eight of the nation's major commercial airports – it was subsequently privatized in the late 1980s, and following its takeover by the Spanish Ferrovial consortium in 2006, has been further divested and downsized to operating just Heathrow now. Germany's Frankfurt Airport is managed by the quasi-private firm Fraport. While in India GMR Group operates, through joint ventures, Indira Gandhi International Airport and Rajiv Gandhi International Airport. Bengaluru International Airport and Chhatrapati Shivaji International Airport are controlled by GVK Group. 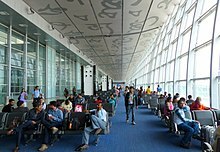 The rest of India's airports are managed by the Airports Authority of India. 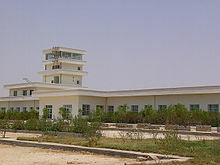 In Pakistan nearly all civilian airports are owned and operated by the Pakistan Civil Aviation Authority except for Sialkot International Airport which has the distinction of being the first privately owned public airport in Pakistan and South Asia. In the United States, commercial airports are generally operated directly by government entities or government-created airport authorities (also known as port authorities), such as the Los Angeles World Airports authority that oversees several airports in the Greater Los Angeles area, including Los Angeles International Airport. Airports are divided into landside and airside areas. The landside area is open to the public, while access to the airside area is tightly controlled. The airside area includes all parts of the airport around the aircraft, and the parts of the buildings that are only accessible to passengers and staff. Passengers and staff must be checked by security before being permitted to enter the airside area. Conversely, passengers arriving from an international flight must pass through border control and customs to access the landside area, where they can exit the airport. Many major airports will issue a secure keycard called an airside pass to employees, as some roles require employees to frequently move back and forth between landside and airside as part of their duties. A terminal is a building with passenger facilities. Small airports have one terminal. Large ones often have multiple terminals, though some large airports like Amsterdam Airport Schiphol still have one terminal. The terminal has a series of gates, which provide passengers with access to the plane. For both sets of passengers, there must be a link between the passenger facilities and the aircraft, such as jet bridges or airstairs. There also needs to be a baggage handling system, to transport baggage from the baggage drop-off to departing planes, and from arriving planes to the baggage reclaim. 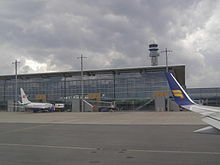 The area where the aircraft park to load passengers and baggage is known as an apron or ramp (or incorrectly, "the tarmac"). Terminal 2 at Mumbai's Chattrapati Shivaji International Airport. 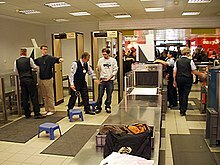 Airport security normally requires baggage checks, metal screenings of individual persons, and rules against any object that could be used as a weapon. Since the September 11 attacks and the Real ID Act of 2005, airport security has dramatically increased and got tighter and stricter than ever before. Most major airports provide commercial outlets for products and services. Most of these companies, many of which are internationally known brands, are located within the departure areas. These include clothing boutiques and restaurants and in the US amounted to $4.2 billion in 2015. Prices charged for items sold at these outlets are generally higher than those outside the airport. However, some airports now regulate costs to keep them comparable to "street prices". This term is misleading as prices often match the manufacturers' suggested retail price (MSRP) but are almost never discounted. Every cargo terminal has a landside and an airside. The landside is where the exporters and importers through either their agents or by themselves deliver or collect shipments while the airside is where loads are moved to or from the aircraft. In addition cargo terminals are divided into distinct areas – export, import and interline or transshipment. Airports require parking lots, for passengers who may leave the cars at the airport for a long period of time. Large airports will also have car rental firms, taxi ranks, bus stops and sometimes a train station. Many large airports are located near railway trunk routes for seamless connection of multimodal transport, for instance Frankfurt Airport, Amsterdam Airport Schiphol, London Heathrow Airport, Tokyo Haneda Airport, Tokyo Narita Airport, London Gatwick Airport and London Stansted Airport. It is also common to connect an airport and a city with rapid transit, light rail lines or other non-road public transport systems. Some examples of this would include the AirTrain JFK at John F. Kennedy International Airport in New York, Link Light Rail that runs from the heart of downtown Seattle to Seattle–Tacoma International Airport, and the Silver Line T at Boston's Logan International Airport by the Massachusetts Bay Transportation Authority (MBTA). Such a connection lowers risk of missed flights due to traffic congestion. Large airports usually have access also through controlled-access highways ('freeways' or 'motorways') from which motor vehicles enter either the departure loop or the arrival loop. The distances passengers need to move within a large airport can be substantial. It is common for airports to provide moving walkways, buses, and rail transport systems. Some airports like Hartsfield–Jackson Atlanta International Airport and London Stansted Airport have a transit system that connects some of the gates to a main terminal. Airports with more than one terminal have a transit system to connect the terminals together, such as John F. Kennedy International Airport, Mexico City International Airport and London Gatwick Airport. Apron or ramp: a surface where planes are parked, loaded, unloaded or refuelled. Air traffic control (ATC) is the task of managing aircraft movements and making sure they are safe, orderly and expeditious. At the largest airports, air traffic control is a series of highly complex operations that requires managing frequent traffic that moves in all three dimensions. 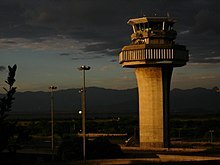 A "towered" or "controlled" airport has a control tower where the air traffic controllers are based. Pilots are required to maintain two-way radio communication with the controllers, and to acknowledge and comply with their instructions. A "non-towered" airport has no operating control tower and therefore two-way radio communications are not required, though it is good operating practice for pilots to transmit their intentions on the airport's common traffic advisory frequency (CTAF) for the benefit of other aircraft in the area. The CTAF may be a Universal Integrated Community (UNICOM), MULTICOM, Flight Service Station (FSS), or tower frequency. The majority of the world's airports are small facilities without a tower. Not all towered airports have 24/7 ATC operations. In those cases, non-towered procedures apply when the tower is not in use, such as at night. Non-towered airports come under area (en-route) control. Remote and virtual tower (RVT) is a system in which ATC is handled by controllers who are not present at the airport itself. Air traffic control responsibilities at airports are usually divided into at least two main areas: ground and tower, though a single controller may work both stations. The busiest airports may subdivide responsibilities further, with clearance delivery, apron control, and/or other specialized ATC stations. Ground control is responsible for directing all ground traffic in designated "movement areas", except the traffic on runways. This includes planes, baggage trains, snowplows, grass cutters, fuel trucks, stair trucks, airline food trucks, conveyor belt vehicles and other vehicles. Ground Control will instruct these vehicles on which taxiways to use, which runway they will use (in the case of planes), where they will park, and when it is safe to cross runways. When a plane is ready to takeoff it will be turned over to Tower Control. Conversely, after a plane has landed it will depart the runway and be "handed over" from Tower to Ground Control. Tower control is responsible for aircraft on the runway and in the controlled airspace immediately surrounding the airport. Tower controllers may use radar to locate an aircraft's position in three-dimensional space, or they may rely on pilot position reports and visual observation. They coordinate the sequencing of aircraft in the traffic pattern and direct aircraft on how to safely join and leave the circuit. Aircraft which are only passing through the airspace must also contact Tower Control in order to be sure that they remain clear of other traffic. At all airports the use of a traffic pattern (often called a traffic circuit outside the U.S.) is possible. They may help to assure smooth traffic flow between departing and arriving aircraft. There is no technical need within modern commercial aviation for performing this pattern, provided there is no queue. And due to the so-called SLOT-times, the overall traffic planning tend to assure landing queues are avoided. If for instance an aircraft approaches runway 17 (which has a heading of approx. 170 degrees) from the north (coming from 360/0 degrees heading towards 180 degrees), the aircraft will land as fast as possible by just turning 10 degrees and follow the glidepath, without orbit the runway for visual reasons, whenever this is possible. For smaller piston engined airplanes at smaller airfields without ILS equipment, things are very different though. At controlled airports, a circuit can be in place but is not normally used. Rather, aircraft (usually only commercial with long routes) request approach clearance while they are still hours away from the airport; the destination airport can then plan a queue of arrivals, and planes will be guided into one queue per active runway for a "straight-in" approach. While this system keeps the airspace free and is simpler for pilots, it requires detailed knowledge of how aircraft are planning to use the airport ahead of time and is therefore only possible with large commercial airliners on pre-scheduled flights. The system has recently become so advanced that controllers can predict whether an aircraft will be delayed on landing before it even takes off; that aircraft can then be delayed on the ground, rather than wasting expensive fuel waiting in the air. There are a number of aids available to pilots, both visual and electronic, though not all airports are equipped with them. A visual approach slope indicator (VASI) helps pilots fly the approach for landing. 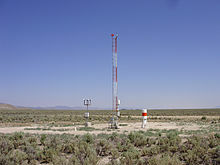 Some airports are equipped with a VHF omnidirectional range (VOR) to help pilots find the direction to the airport. VORs are often accompanied by a distance measuring equipment (DME) to determine the distance to the VOR. VORs are also located off airports, where they serve to provide airways for aircraft to navigate upon. In poor weather, pilots will use an instrument landing system (ILS) to find the runway and fly the correct approach, even if they cannot see the ground. The number of instrument approaches based on the use of the Global Positioning System (GPS) is rapidly increasing and may eventually become the primary means for instrument landings. Planes take-off and land into the wind in order to achieve maximum performance. Because pilots need instantaneous information during landing, a windsock can also be kept in view of the runway. Aviation windsocks are made with lightweight material, withstand strong winds and some are lit up after dark or in foggy weather. Because visibility of windsocks is limited, often multiple glow-orange windsocks are placed on both sides of the runway. A tow tractor to move the aircraft in and out of the berth. A jet bridge (in some airports) or stairs unit to allow passengers to embark and disembark. A ground power unit for supplying electricity. As the engines will be switched off, they will not be generating electricity as they do in flight. A catering service to deliver food and drinks for a flight. A toilet waste truck to empty the tank which holds the waste from the toilets in the aircraft. 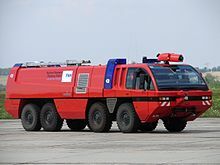 A water truck to fill the water tanks of the aircraft. A refueling vehicle. The fuel may come from a tanker, or from underground fuel tanks. A conveyor belt unit for loading and unloading luggage. A vehicle to transport luggage to and from the terminal. The length of time an aircraft remains on the ground in between consecutive flights is known as "turnaround time". Airlines pay great attention to minimizing turnaround times in an effort to keep aircraft utilization (flying time) high, with times scheduled as low as 25 minutes for jet aircraft operated by low-cost carriers on narrow-body aircraft. Like industrial equipment or facility management, airports require tailor-made maintenance management due to their complexity. With many tangible assets spread over a large area in different environments, these infrastructures must therefore effectively monitor these assets and store spare parts in order to maintain them at an optimal level of service. To manage these airport assets, several solutions are competing for the market: CMMS (computerized maintenance management system) predominate, and mainly enable a company's maintenance activity to be monitored, planned, recorded and rationalized. During the 1980s, a phenomenon known as microburst became a growing concern due to aircraft accidents caused by microburst wind shear, such as Delta Air Lines Flight 191. Microburst radar was developed as an aid to safety during landing, giving two to five minutes' warning to aircraft in the vicinity of the field of a microburst event. Airports often have on-site firefighters to respond to emergencies. These use specialized vehicles, known as airport crash tenders. A growing number of airports are installing solar photovoltaic arrays to offset their electricity use. The National Renewable Energy Lab has shown this can be done safely. Most airport names include the location. Many airport names honour a public figure, commonly a politician (e.g., Charles de Gaulle Airport, George Bush Intercontinental Airport, John F. Kennedy International Airport), a monarch (e.g. 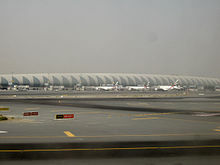 Chhatrapati Shivaji International Airport, King Abdulaziz International Airport), a cultural leader (e.g. Liverpool John Lennon Airport, Leonardo da Vinci-Fiumicino Airport, Louis Armstrong New Orleans International Airport) or a prominent figure in aviation history of the region (e.g. Sydney Kingsford Smith Airport), sometimes even famous writers (e.g. Allama Iqbal International Airport) and explorers (e.g. Venice Marco Polo Airport). Some airport names include the word "International" to indicate their ability to handle international air traffic. This includes some airports that do not have scheduled international airline services (e.g. Albany International Airport). The earliest aircraft takeoff and landing sites were grassy fields. The plane could approach at any angle that provided a favorable wind direction. A slight improvement was the dirt-only field, which eliminated the drag from grass. However, these only functioned well in dry conditions. Later, concrete surfaces would allow landings regardless of meteorological conditions. The title of "world's oldest airport" is disputed, but College Park Airport in Maryland, US, established in 1909 by Wilbur Wright, is generally agreed to be the world's oldest continually operating airfield, although it serves only general aviation traffic. Bisbee-Douglas International Airport in Arizona was declared "the first international airport of the Americas" by US president Franklin D. Roosevelt in 1943. Pearson Field Airport in Vancouver, Washington, had a dirigible land in 1905 and planes in 1911 and is still in use. Hamburg Airport opened in January 1911, making it the oldest commercial airport in the world which is still in operation. Bremen Airport opened in 1913 and remains in use, although it served as an American military field between 1945 and 1949. 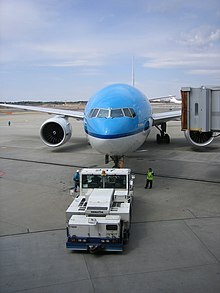 Amsterdam Airport Schiphol opened on September 16, 1916, as a military airfield, but only accepted civil aircraft from December 17, 1920, allowing Sydney Airport in Sydney, Australia—which started operations in January 1920—to claim to be one of the world's oldest continually operating commercial airports. Minneapolis-Saint Paul International Airport in Minneapolis-Saint Paul, Minnesota, opened in 1920 and has been in continuous commercial service since. It serves about 35,000,000 passengers each year and continues to expand, recently opening a new 11,000 foot (3,355 meter) runway. Of the airports constructed during this early period in aviation, it is one of the largest and busiest that is still currently operating. 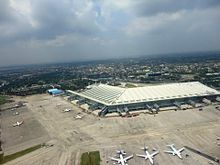 Rome Ciampino Airport, opened 1916, is also a contender, as well as the Don Mueang International Airport near Bangkok, Thailand, which opened in 1914. Increased aircraft traffic during World War I led to the construction of landing fields. Aircraft had to approach these from certain directions and this led to the development of aids for directing the approach and landing slope. Airports have played major roles in films and television programs due to their very nature as a transport and international hub, and sometimes because of distinctive architectural features of particular airports. One such example of this is The Terminal, a film about a man who becomes permanently grounded in an airport terminal and must survive only on the food and shelter provided by the airport. They are also one of the major elements in movies such as The V.I.P.s, Speed, Airplane!, Airport (1970), Die Hard 2, Soul Plane, Jackie Brown, Get Shorty, Home Alone, Liar Liar, Passenger 57, Final Destination (2000), Unaccompanied Minors, Catch Me If You Can, Rendition and The Langoliers. They have also played important parts in television series like Lost, The Amazing Race, America's Next Top Model, Cycle 10 which have significant parts of their story set within airports. In other programmes and films, airports are merely indicative of journeys, e.g. Good Will Hunting. Several computer simulation games put the player in charge of an airport. These include the Airport Tycoon series, SimAirport and Airport CEO. Most airports welcome filming on site, although it must be agreed in advance and may be subject to a fee. Landside, filming can take place in all public areas. However airside, filming is sometimes heavily restricted. To film in an airside location, all visitors must go through security, the same as passengers, and be accompanied by a full airside pass holder and have photographic identification with them at all times. Filming is strictly prohibited in security, immigration/customs and baggage reclaim. The U.S. uses the Airport/Facility Directory (A/FD), published in seven volumes. DAFIF also includes extensive airport data but has been unavailable to the public at large since 2006. ^ Wragg, D.; Historical dictionary of aviation, History Press 2008. ^ "Airport – Definition of airport by Merriam-Webster". Retrieved 1 September 2015. 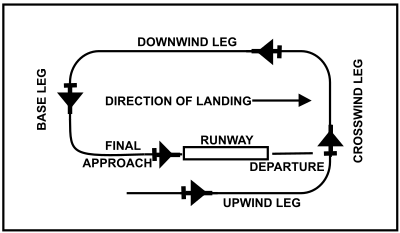 ^ "Runway – Definition of runway by Merriam-Webster". Retrieved 1 September 2015. ^ "Helipad – Definition of helipad by Merriam-Webster". Retrieved 1 September 2015. ^ "Hangar – Definition of hangar by Merriam-Webster". Retrieved 1 September 2015. ^ "AirNav: 1ID9 - Skyline Airport". www.airnav.com. Retrieved 2018-04-10. ^ "The World Factbook". Retrieved 1 September 2015. ^ "FAA". Retrieved 1 September 2015. ^ "Part 139 Airport Certification". FAA. 2009-06-19. Archived from the original on 29 July 2010. Retrieved 2010-07-20. ^ "Airport & Airway Trust Fund (AATF)". www.faa.gov. Retrieved 2019-04-17. ^ Gross, Daniel (7 September 2017). "Your Misery at the Airport Is Great for Business". Slate. Retrieved 8 September 2017. ^ "Why do airports have windsocks?". Piggotts Flags And Branding. Retrieved 29 March 2017. ^ a b Mothes, Daphné (15 January 2019). "Improve your airport maintenance with your CMMS". Mobility Work. Retrieved 2 April 2019. ^ Sherry, Lance (2009). "Introduction to Airports Design and Operations" (PDF). George Mason University Center for Air Transportation Systems Research. ^ "7 cool solar installations at U.S. airports". www.solarpowerworldonline.com. ^ Thomas, Andrew R. (2011). Soft Landing: Airline Industry Strategy, Service, and Safety. Apress. p. 154. ISBN 978-1-4302-3677-1. ^ "College Park Airport". Pgparks.com. Archived from the original on May 31, 2009. Retrieved 2010-07-20. ^ "Sydney Airport history" (PDF). Archived from the original (PDF) on 2009-04-01. Retrieved 2010-07-20. ^ "En route Supplement Australia (ERSA)". Airservices.gov.au. 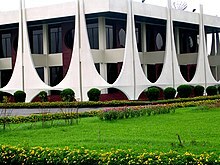 2010-07-16. Retrieved 2010-07-20. ^ "Aeronautical Information Publication (AIP), NOTAMs in Japan". Japan Civil Aviation Bureau. Archived from the original on 2011-07-22. Retrieved 2011-02-14.